The most notable influences come from African, English, Scottish, Irish, French, and Native American cuisines. In recent history, elements of Southern cuisine have spread north, having an effect on the development of other types of American cuisine. Many elements of Southern cooking—squash, tomatoes, corn and deep-pit barbecuing—are borrowings from southeast American Indian tribes. Sugar, flour, milk, and eggs come from Europe; the Southern fondness for fried foods is Scottish, and the old-fashioned Virginian use of ragouts comes from the West Country of England. Black-eyed peas, okra, rice, eggplant, benne (sesame) seed, sorghum, and melons, as well as most spices used in the South, are originally African; a preponderance of slaves imported to Virginia in early years were Igbo from the Bight of Biafra, and down to the present day Southern and Nigerian cuisines have many flavors and elements in common. The South's fondness for a full breakfast (as opposed to a Continental one with a simple bread item and drink) derives from the British full breakfast or fry-up, variously known as the full English breakfast. Many Southern food-ways are Scottish or Border meals adapted to the new subtropical climate; pork, informally taboo in Scotland, takes the place of lamb and mutton, and instead of chopped oats, Southerners eat chopped hominy (although oatmeal is much more common now than it once was). Parts of the South have other cuisines, though. Creole cuisine is mostly vernacular French, West African and Spanish; Floribbean cuisine is Spanish-based with obvious Caribbean influences; and Tex-Mex has considerable Mexican and Native American influences. 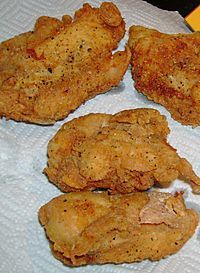 A traditional Southern meal is pan-fried chicken, apple pie, field peas (such as black-eyed peas), greens (such as collard greens, mustard greens, turnip greens, or poke salad), mashed potatoes, cornbread or corn pone, sweet tea, and dessert—typically a pie (sweet potato, chess, shoofly, pecan, and peach are the most common), or a cobbler (peach, blackberry, sometimes apple in Kentucky or Appalachia). 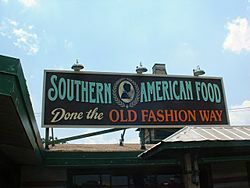 Other Southern foods include grits, country ham, hushpuppies, beignets, Southern styles of succotash, chicken fried steak, buttermilk biscuits (may be served with butter, jelly, fruit preserves, honey, gravy or sorghum molasses), pimento cheese, boiled or baked sweet potatoes, pit barbecue, fried catfish, fried green tomatoes, bread pudding, okra (fried, steamed, stewed, sauteed, or pickled), butter beans, pinto beans, and black-eyed peas. Fried chicken is among the region's best-known exports. 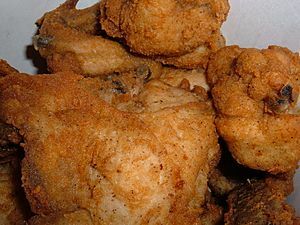 It is believed that the Scots, and later Scottish immigrants to many southern states had a tradition of deep frying chicken in fat, unlike their English counterparts who baked or boiled chicken. Pork is an integral part of the cuisine. Stuffed ham is served in Southern Maryland. A traditional holiday get-together featuring whole hog barbecue is known in Virginia and the Carolinas as a "pig pickin'". Green beans are often flavored with bacon and salt pork, turnip greens are stewed with pork and served with vinegar, ham biscuits (biscuits cut in half with slices of salt ham served between the halves) often accompany breakfast, and ham with red-eye gravy or country gravy is a common dinner dish. Coleslaw is also popular, both as a side dish and on a variety of barbecued and fried meats. Apart from it, though, Southern cooking makes little use of cabbage. Chains serving Southern foods—often along with American comfort food—have had great success; many have spread across the country (or across the world), while others have chosen to stay in the South. Pit barbecue is popular all over the American South; unlike the rest of the country, most of the rural South has locally owned, non-franchise pit-barbecue restaurants. Family-style restaurants serving Southern cuisine are common throughout the South, and range from the humble and down-home to the decidedly upscale. In Southern Louisiana, there is Creole cuisine. Louisiana is the largest supplier of crawfish in the U.S. In the coastal areas of South Carolina, rice was an important crop, leading to local specialties like "Hoppin' John" (a mixture of rice and Black-eyed peas flavored with salt pork) and Charleston Red Rice. Arkansas produces Riceland rice and sweet corn, both of which are staples of the cuisine of Southeastern Arkansas. Mississippi and Alabama produce the most catfish in the United States. Generally speaking, the Upper South favors pork, sorghum, and whiskey; the Low Country (the coast, especially coastal Georgia and coastal South Carolina) favors seafood, rice, and grits. 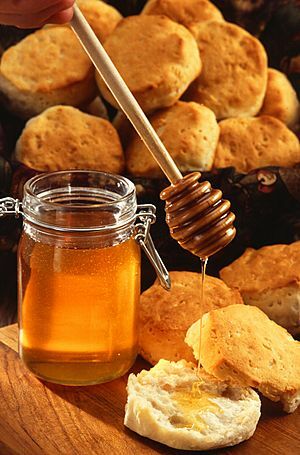 Appalachia uses butter extensively but makes little use of cheese, and eats more wild game (as well as wild fruits and vegetables) than the rest of the South; apples, oats, and potatoes are also common in Appalachian cuisine, since the mountains are cooler and drier than the lowlands. Texas and Oklahoma, where the South shades into the Great Plains, tend to eat beef; the rest of the South (including Arkansas, which is geologically more like Appalachia than anything) prefers pork. 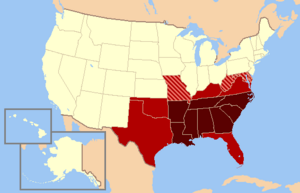 Cuisine of the Southern United States Facts for Kids. Kiddle Encyclopedia.